To continue the revival of local Stirling traditions, the Incorporation of Hammermen celebrated their 2nd Annual Burns supper in The Golden Lion Hotel to commemorate the Bard’s visit to the very same hotel on 26th August 1787. Deacon Stuart Campbell chaired the proceedings with Dr John Rankin giving a very thoughtful and witty Immortal Memory. A musical interlude followed from local musician Dougal Thornton, who sang some famous songs penned by Burns. Stirling’s very own David Sibbald then went on to give a rendition of Tam ‘O’ Shanter illustrated with the cartoons of Joseph D Shearer. Baillie Andy McEwen rounded off the evening with a Toast to the City of Stirling. 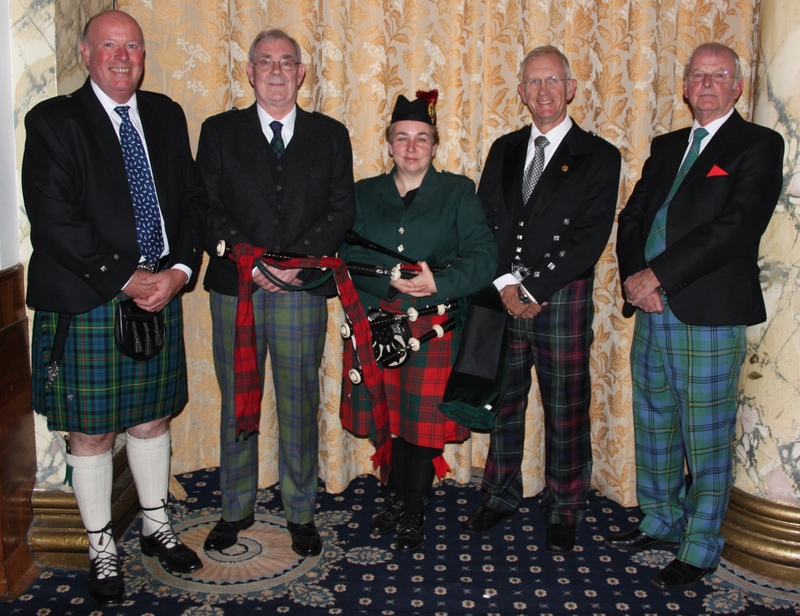 Pictured (L-R) are Baillie Andy McEwan, Deacon Stuart Campbell, Piper Shauna Shand, Dr John Rankin and Baillie Ken Johnston. Some pictures of the evenings proceedings. This entry was posted in Uncategorized and tagged Burns supper, David Sibbald. Bookmark the permalink.